What causes headache is a question oft heard in the clinic. What causes headache, and especially back of head pain, is not an easy question to answer as there are multiple precipitating factors. So this is not an exhaustive treatise on the subject. For that I would have to write a book; but here are a few pointers. Some 80 percent of cephalgia is reckoned to be tension in nature. This is not from stress, but tightness of the meninges surrounding the spinal cord and brain. That could be related to long hours spent over the computer, or an old whiplash injury, for example. The meninges, consisting of three layers, cover the brain and spinal cord which interestingly are really one organ. Anatomists have now discovered that the outermost covering is directly connected to one of the tiny muscles in the neck. 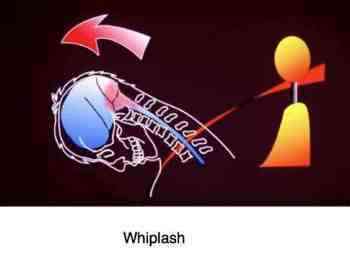 So anything that stretches the meninges, like whiplash, causes that muscle to spasm, and will directly give you a back of head pain. And any force that stretches that tiny muscle has an impact directly on the brain and spinal cord. It's one of the most sensitive areas in the body. Pick up something that weighs perhaps a kilogram, and hold it with a bent elbow for a few minutes, without moving your arm. 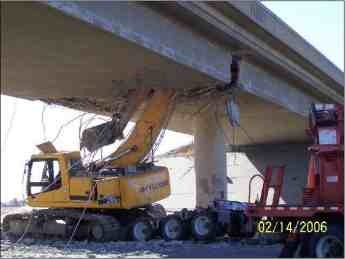 Feel how the limb tires? Then the biceps starts to spasm. And then your arm says to you, put the damn thing down, won't you? 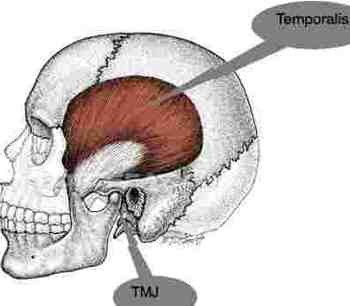 The jaw joint is another major factor in what causes headache; whether it's bruxism, or grinding of the teeth at night, or simply TMJ dysfunction, tension develops in the muscles supplying the area, especially the face and side of the head. This is rather different to back of head pain, often radiating deep in the face, or to the eye and masquerading as migraine or sinusitis; they are all supplied by the same Trigeminal nerve. And, because its sensory nucleus is located in the upper neck, that's often where it's felt too. What causes headache is a question oft heard in the chiropractic clinic. See these tiny muscles at the top of your neck - one of them, never mind which, is directly connected to those meninges. That's exactly what they start to say when you've been sitting too long at the computer - just like mine are saying right now! - or behind the wheel of the car. It's time to move! they are trying to tell us. So move. Stiff neck exercises for neck pain and headache. As you are beginning to realise back of head headache, and the whole subject is remarkably complex; manipulation of the cervical spine, and the jaw joints is only part of the solution. It's tied with ergonomics, movement, posture, and so on. If you are desk bound, expect to have pain. Another very common cause is the cervical facet syndrome in the upper neck; it's the area that we chiropractors are most concerned about in answering your question, what causes headache; but it's only one part of the whole. You may be interested in some of the anatomy of this area if you are wondering what causes headache. This is called an oblique Xray, showing where the nerves emerge from tiny gaps between the vertebrae called a foramen. Two nerves, the Greater and Lesser Occipital nerves emerge from the upper foramena and supply the scalp. See if you can trace them from where they emerge from the spine, and that handsome dude will tell you where the headache is likely to be. I've been working on this page for an hour and a half, and my suboccipital muscles are starting to tell me that if I don't take a tea break, I'm going to find out big time what one of the causes of headache is. So you take a break too. I'll be waiting for you when your tea is made, not going anywhere, promise! I'm making mine just with some very weak black (this time, green is better scientists tell us) in a thermos of boiled drinking water, to which I'm going to add a good squeeze from a grapefruit that I've just cut. Keep it natural! The rest I'll eat for breakfast. Don't forget the pulp, that's where the flavonoids and phytosterols are found. None of that stuff from a carton! If you're a black or green tea lover like I am, you may know (perhaps you don't) that teabag tea tastes crap, excuse the vocab, in comparison with loose tea. I always used to think it was the bag, but no. I'm treating a Lipton man right now, from the Dutch factory, and he tells me that process it in quite a different way. A crap way, sorry if you're a tea bag man or woman. It's worth the effort of dealing with the tea leaves. Could your migraine headache be emanating from the jaw joint? 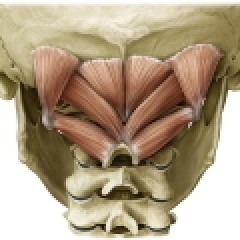 Perhaps a little better understanding of the TMJ anatomy might bring some clarity. TMJ ear pain and back of neck headache are bedfellows. If you are questioning what causes headache, then don't forget to consider the jaw joint. Do you get a headache just above the ear, round the jaw joint, a one sided headache, and sometimes simultaneously at the base of the neck? Do questions about clicking, popping jaw joints or grinding teeth ring any bells? 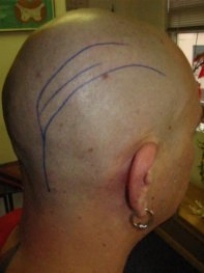 A malfunctioning TMJ, the jaw joint, is one of the main causes of terrible migraine headache. Not every chiropractor I'm afraid will have the knowledge and expertise to treat this, but it's one of my favourite conditions. Chiropractors can and should treat every joint in the body, except those between the ossicles in the inner ear! What causes headache is not an easy question to answer as there are multiple causes; meningitis is a rare one. PLEASE, PLEASE, if you have a stiff neck and headache AND A FEVER don't call your chiropractor, phone your doctor. Now. And that applies to your child too, of course. And your spouse. Meningitis is a killer. I'll never forget when my best friend lost his wife at 50 odd with sudden onset of fever and headache, and she was gone in three days. And no, I wasn't the guilty party. They wisely didn't consult me. I could go on and on. What causes headache is complex subject eyesight, brain tumours, toxemia of pregnancy, just the flu, but this page is long enough. Oh, I nearly forgot, Twit! Is there neck pain treatment for your headaches. Of course! And an interesting What causes Headaches Casefile. 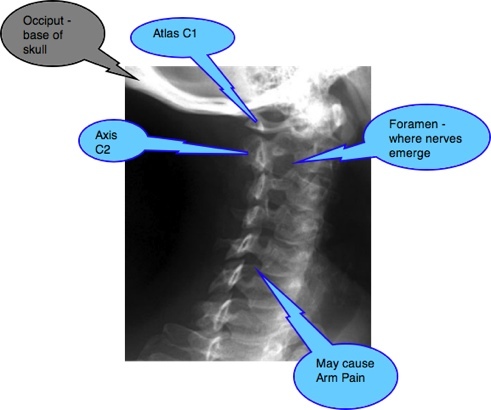 Does arthritis of the neck cause headache? It can be very misleading. The telephone, particularly if you hold it between your ear and shoulder, is a major in answering what causes headache. For just the price of a couple chiropractic consultations you can get a headset; prevention as always is better than a cure. 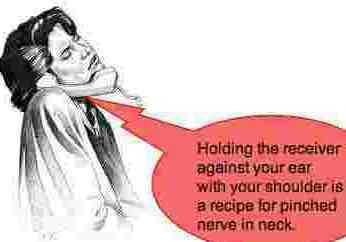 PINCHED NERVE IN NECK ... may also be caused by your telephone posture. Chiropractic help is the place to be, in the absence of obvious medical symptoms like fever, if you are asking what causes headache, and especially if there is associated neck pain or jaw joint clicking and popping; the first stop for the patient suffering from headaches must surely be the chiropractor. Pain ironically is your friend. Simply attempting to turn it off where there is an obvious source makes no sense whatsoever; rather get to the root of what causes headache. At the Chiropractic Coalface we regularly see relatively young persons with the onset of significant arthritis in the neck after trauma. Virtually always there is a history of headache. A careful and thorough examination of the cervical spine, and appropriate treatment at the time of the accident would have helped prevent a lifetime of spinal pain and cartilage deterioration. Do you have a headache? Pain medicines are another cause of headaches; whether they cause rebound headache, or because as the National Kidney Foundation reports they can damage your kidneys, you want to strictly limit them. 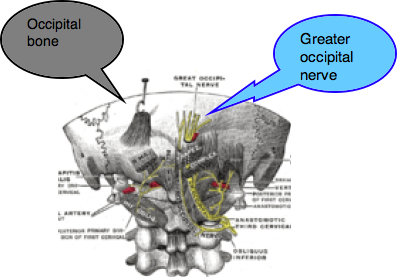 OCCIPITAL NEURALGIA ... an excellent more detailed page. FRIDAY FUN HEADACHE ... read on, you won't be sorry! Chiropractic Help » Head neck pain » What causes headache?